Has anyone seen or fabricated a small portable soil screener that I could use as a start for designing my own? I have seen comercial units parked on job sites, but never looked at one up close, seems like it would be a simple matter to fabricate a small version.In my case i would use an electric motor for power. There are several threads on this subject. I tried giving you the info but your PM hasn't been activated. Sorry I can't post it here. If you PM me I will give you the info. My dad made one of hardware cloth (galvanized 1/4 x 1/4" welded wire mesh used for rabbit cages) that was a 3' diameter x 12' long rotating cylinder. The input end was elecvated about a foot higher than the other end. We hand-fed compost through it, but a chute of sorts would have helped. This type of screener is called a "trommel" or "rotating drum". These are not high-volume machines but are effective. The spoils or debris are eventually rotated or tumbled out of the drum in a neat pile. The high-voulme machines you see on construction sites may be a sifter or shaker type, which use a conveyor to shred or pull apart soil in small amounts as it goes up a conveyor. Then it goes drops through 4-5 vibrating "screens" or sets of parallel wires that form a screen which sift out the soil and debris. This type of screener typically has topsoil that looks like little balls from the rolling action of the conveyor and the wire screens. what I like is no moving parts no oil to check or things to grease!!! I'm thinking of making it 4' wide by 5 or 6 feet long using a 2x4 frame around the out side edges and a 2x4 in the center ran length ways from top to bottom. Instead of resting the top on fence post I plan on using 2 folding 2x4 legs hinged at the top on each side. When not in use the legs will fold down and run flat along side the long outside 2x4 frame. By shrinking the size a little and using only 5 two by fours instead of 9 two by sixes it will greatly reduce the weight making it much easier to handle & far more portable. The folding legs allow it to be folded into one rectangular shape making it easier to store by simply standing it on edge and leaning it against a wall. If one were to use treated two by fours it could be stored outside by leaning it against a tree or what ever else may be out there handy. When we were building out a course in the islands they had made up a small screen for cleaning up a little topsoil that had been contaminated with gravel and stuff. It was a rectangular steel frame on tall legs, like a big table with no top on it. A chain in each corner suspended a smaller rectangular frame that had a steel mesh bottom. 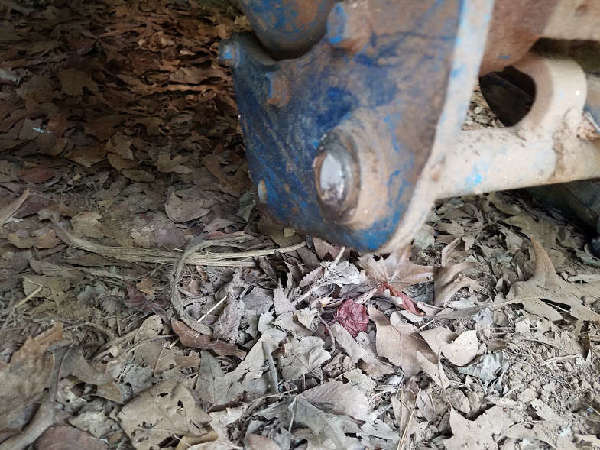 There was a hydraulic motor attached to the hanging frame that spun an off-center cam, that caused a vibratory / shaking action depending on the speed the motor turned. It worked well, but it sure looked like an explosion in a structural steel plant. with a large bed suspended in between, With a washing machine motor & agitator shaking the screen. Nice but I don't used quite that much compost! The size and style Ibrown59 has in mind will suite me. and my little orange BX23.